SipNGive – Wine, Giving Back to Others,Travel and Food. Wine, Giving Back to Others,Travel and Food. Yassss I have finally began my travel adventures. I have been looking to start my treks around the globe and it looks like my season is now!!! whoooooohoooo!! LOL. So I think my first trip will be to the Bahamas maybe a 2 night cruise, something small. I have in the meantime started my career as a travel agent. I am stoked. I do currently have a host Agency but I am an independent Travel Agent! Yessss! So I knew that I want to go to Cuba whenever the option was made available. I do currently have a group cruise planned for February 17-21, 2019 and we will be leaving the Fort Lauderdale, Florida Port heading to Havana,Cuba and Nassau,Bahamas. For more information about that group cruise get more information here: Cuba,Bahamas Cruise Feb2019. We are able to travel to Cuba now as U.S. Citizens. Per the U.S. Embassy in Cuba there are some things that you should be aware of prior to traveling to Cuba. I do advise that you read up on those things in your leisure but if you are on a cruise and have your visa and all other papers and identifications you should be fine. Make sure that you have gotten the latest information. The regular drivers license will say “not for federal identification” if it does not meet the requirements under the REAL ID Act with your state DMV. Of course you need to have your Passport if you do not currently have one. You can do the passport a few different ways. Some Travel Agents as well as Travel.state.gov (direct self led) can offer you passport assistance through a passport and visa agency who will basically just get the needed documentation from you and have the information expedited to the appropriate federal and state agencies for you. There is a free service that allows U.S. citizens and nationals traveling and living abroad to enroll their trip with the nearest U.S. Embassy or Consulate. That service is called STEP and you can enroll here: STEP. Enroll in the Smart Traveler Enrollment Program for support when abroad – this will help locate you in the event of an emergency or to send important health, safety, or emergency information while you are abroad. I hope this information has been useful and lets start this adventure together! I will be providing lots of insights, going live, and talking to the locals in Havana! Stay tuned! So everyone is proud of something and if you don’t stand for something you will fall for anything. I am proud of anyone who is being their authentic self even if my beliefs are not the same as that anyone. I only have a couple of rules for my friends and associates and we will get along fine regardless of your beliefs. If we have things in common then lets just socialize about our commonalities…there is no reason for any hostilities at all. Rule #1-Respect everyone. #2-Refer to rule #1. You don’t have to like anyone, even though that would be awesome if we did choose to…but please please please respect life!!!! So enough with the lesson for today. I am writing to say Happy Pride Month to all of my friends, associates, and family in the LBGTQ Community…I love you!!!!! viaONEHOPE has a special going on for Pride Month because we have this wonderfully rainbow sparkly wine bottle and the wine is sparkly too! The wine in these bottles is our Brut which is fantastic by the way. I prefer my Brut either straight or for light refreshment throughout the day as a spritzer with a little ginger ale. I did let one of my long time friends know about “spritzing” and she is now a fan…try it!!! But back to the sparkly rainbow glitter wine bottle…it is shipping out for the month of June for just one penny yall! !….what yes the Rainbow Glitter Brut ships for $0.01 all June long!! So get you a couple of bottles or if you are having an event and want to celebrate your pride contact me and we can get you a bulk discount rate on a couple of cases of the Rainbow Glitter Bottle!!! #winning #rainbow #pridemonth #lbgt BUT WAIT…theres more…Every 4 bottles funds one hour of operational costs for Trevor Project!!!! The Trevor Project is the leading national organization providing crisis intervention and suicide prevention services to lesbian, gay, bisexual, transgender, and questioning youth. What Pairs Best With Fish? Zesty Sauces– Light white wines with citrus notes. Sweet (Teriyaki style) Sauces– The sweeter the sauce- the sweeter the wine. Try to up the ante by a notch or two. Spicy Sauces– If you taste chili powder, reach for the Riesling. Curry Sauces– Think sweet. Wines like Riesling or Moscato work best. Savory Sauces– Smell basil, parsley, dill or capers? This is the perfect time to order a glass of Sauvignon Blanc. Smoked Meat- These meats tend to be a bit drier, and benefit greatly from a sparkling wine. I mean feel free to drink your wine with just the glassware and good friends, but hey a girls gotta eat! Until June 12th we have gift boxes @10% off for Fathers Day! Don’t forget Dad this year and get him something he will enjoy and let him know his gift gave back to help children with Autism!! All of the necessities to keep you on par. 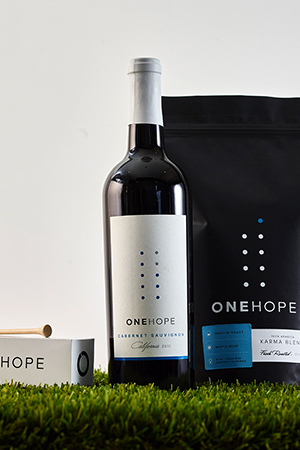 Each gift includes: ONEHOPE Karma Blend CoFFee for before your round, ONEHOPE CA Cabernet Sauvignon for that hole-in-one, package of three golf balls, and tees. See you on the green! Every box helps fund ABA therapy for children with autism. We also have our morning gift box for men!! Morning Man Gift Box The perfect morning starts with the perfect shave. 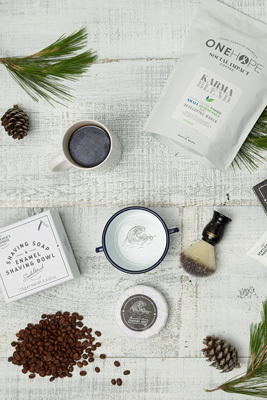 Includes Gentleman’s Hardware shaving brush, shaving soap and enamel soap bowl, aftershave, a pound of ONEHOPE Karma Blend Coffee, and your choice of mug* in a white gift box. Every box funds a year of clean drinking water for one person in need. Please Note: We are now currently shipping the black 1LB coffee bag. This does not have an impact on the taste of the coffee. This can be for any gift for the man in your life!!! Thanks for joining me! Sit back and enjoy this adventure with me about wine, giving back, food and travel!! !